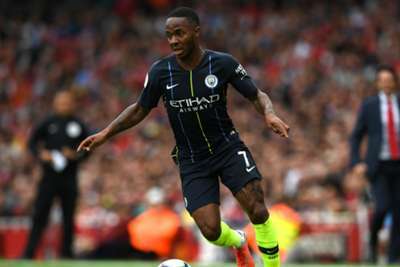 Pep Guardiola is willing to wait for Raheem Sterling to sign a new deal at Manchester City – even though star midfielder Kevin De Bruyne agreed terms in "two minutes" last season. Sterling is poised to return to action for City at home to Fulham in the Premier League on Saturday, having sat out England's games against Spain and Switzerland with a back injury. The 23-year-old has started the season in fine form for the defending champions, with two goals in three outings to back up 23 across all competitions in 2017-18. Belgium international De Bruyne signed a bumper extension running until June 2023 back in June and Sterling is reported to want pay parity with his team-mate. "I don't know about the salaries or the wages, it's the business of the club," Guardiola said. "We were so delighted with Kevin last season because, after two minutes, they had an agreement. Both [parties] were agreed with what we wanted and it was done in a day. "Sometimes it takes more time because every negotiation is different from the other. "The important thing in that case is that we feel [Sterling] wants to stay and he knows we want him to stay longer. After that we will see." Sterling's fellow winger Leroy Sane returns to club action after a hectic international break with Germany. Sane was a shock omission from Joachim Low's World Cup squad before the reigning champions crashed out in the group stages, while his return for the matches with France and Peru came despite failing to make Guardiola's starting line-up this term. The PFA Young Player of the Year had his attitude publicly called into question by international team-mate Toni Kroos and featured as a substitute against the world champions before being granted leave for the birth of his daughter. "It's normal after what happened last season that people ask about him. His body language is the same as last season and he was the best young player in the league," Guardiola said. "Leroy was so important, is so important, and will be so important for the club. There's no doubt about that. It’s a challenge for him - not just for him, for everybody. "There's a lot of nice strikers and midfield players and the season will be judged on 11 months, not just on three weeks or one month. "He's a nice guy, so I don't have any bad words about him - we are here to try to help, not just him, but everybody." Guardiola added: "Of course, he’s going to respond in the right way. He’s a competitive guy. He will grow up. The most important thing and the most important issue we have is to help them to grow."